"We've just bought it" they said, "This very one. It's ours". Clearly delighted with their new acquisition, they beckoned us below. "Two double cabins aft and another forward. A really comfortable saloon and great facilities for the cook", they said, pointing out the dinette area to starboard, the galley opposite and the diminutive chart table. "We can get eight people around it, and the table drops down to make another double bed. Eight berths in all! It went on like this - two heads complete with showers, velour upholstery everywhere. "Why aren't all cruising sailboat interiors like this? We can't wait to get her in the water", they said, "Weekends cruising along the south coast with our friends and both sets of kids. They just love Poole Harbour. In the summer holidays we'll head farther west, Dartmouth, Salcombe, Plymouth, Fowey, Falmouth, or maybe the Channel Islands if the weather's settled". "As cruising sailboat interiors go", they said, "This one has it all!" 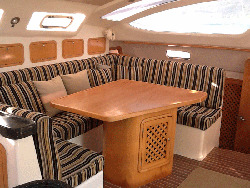 But Are Sailboat Interiors Like This One Suitable For Offshore Cruising? I was about to point out that the prospect of sailing anywhere on a 38ft sailboat with seven other people didn't exactly fill me with joy, when realization dawned - closely followed by relief that my criticism of the boat's apparent shortcomings had remained unspoken. This sailboat wasn't supposed to be an offshore cruiser - it just looked like one from the outside. It was a family sailboat intended for harbour hopping with only an occasional night spent at sea - never far from onshore facilities where its systems could be plugged in and topped up. And just perfect for the use to which the new owners would put it - a veritable sailing recreational vehicle. 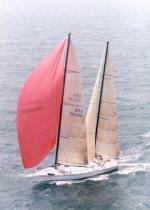 But, had this sailboat been intended for offshore sailing, how would its interior have differed? The primary difference would be that it wouldn't be designed to cater for the requirements of eight people. Four would be an ideal crew, although the sailboat could easily (and most likely would) be handled by two people. In my experience most long-distance sailboats are crewed by a cruising couple, occasionally supplemented by one or two others when on a potentially arduous ocean passage. The two double berths aft rule out all but the most meagre of cockpit lockers. One of the double berths could be retained; the other converted to a bosun's locker for storing warps, fenders, sails, the dinghy, outboard motor and so on, accessed through the heads. The double vee berth forward would serve better as two single berths, with a separate infill piece for use should the forecabin occupants be (or become) closely aquainted. The berths in the after and forecabin will be fine for in-harbour use, but not so when underway. Single sea berths must be provided for the off-watch crew. More on this below, but if the saloon seating is to be utilised for these, it's goodbye to the curved seating in the dinette area. In any event curved seating is seldom successful on sailboats - a progressively smaller length of it remaining comfortable (or even tenable) as the boat heels. Calculating the loo/crew ratio to avert a conflict in times of dire need is an exercise in probability assessment, but by my reckoning more than one head in a boat of this size is a ludicrous waste of space. There's only one sensible location for the heads - aft, at the foot of the companionway. Anywhere else, then in bad weather a wet, dripping, foulie-clad crew member will have to traipse right through the accommodation to get to it. With the two heads taking up the most stable part of the boat, the only place left for the designer to put the galley is forward in the saloon. In hot weather, and with any kind of sea running, the cook won't thank him for this. 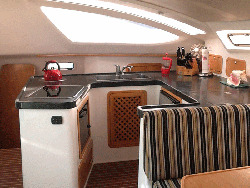 A more practical location for the galley is further aft, next to the companionway as shown here. Berths can be broadly be divided into two types; those that can only be utilised when the boat is flat and level, and those that are also suitable for use in a seaway. All doubles fall into the former category (unless divided by a longitudinal lee cloth) along with forepeak berths on account of the pitching motion in the forward part of the boat. Settee berths, which as the name suggests are the seats for sitting at the cabin table. Often they can be pulled out by a few inches when in bunk mode, to create more width for the slumbering occupant. 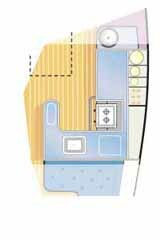 Pilot berths are permanent berths outboard and above the settee backs. These are probably the best bunks of all for daytime sleeping as they don't interfere with the normal use of the cabin. Unfortunately, smaller boats probably won't have sufficient beam for them. Quarter berths are located under the outboard edge of the cockpit. Whilst out of the way of cabin traffic, they tend to be poorly ventilated and can be particularly hot and noisy when under power. Getting in and out of them requires a degree of gymnastic ability. It should be parallel to the centreline of the yacht as is practicable. Otherwise, the occupant will find himself head-down on one tack and head-up on the other - neither attitude being conducive to a decent kip. 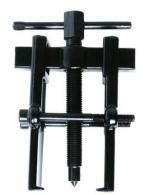 For comfort and security the ideal width is 700mm to 750mm, with 600mm as the absolute minimum. Pilot berths and settee berths must be fitted with lee cloths or bunk boards to keep the occupants snugly in place when the boat is heeling and rolling. 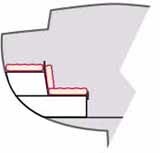 A lee cloth should have a gap of around 500mm at the occupants head for ventilation. The minimum length of the berth should be 2m, which would allow a conventionally proportioned adult to use a pillow. On a short-handed sailboat, there's much to be said for a dedicated sea berth at the foot of the companionway. If the berth cushions are covered in waterproof fabric, a wet and exhausted crew can string a few zzzz's together here - even in his foul-weather gear - until roused from his slumbers by a hearty shout from the cockpit. On Alacazam we've sacrificed a sit-down navigation area in favour of such a berth, and a good compromise it's turned out to be, with all the key facilities - galley, heads, navigation area and sea berth - located at the foot of the companionway. 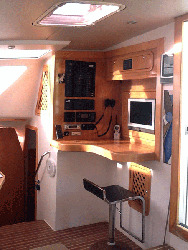 And as sailboat interiors for offshore sailing go, this layout has proven to be extremely practical.